Have questions about estate planning? Not sure what will happen if you pass away without a will? Need information on doing an estate plan? Not sure whether you are receiving adequate information from an executor after a loved one has passed? If so, you need to attend an Estate Planning 101 class. The event is free and includes snacks. Click here for more information. Do you own a business? Are you charitably motivated? Do you want to use your largest asset to make a difference in your community? Are you trying to understand how all of this fits into your business succession plans? Non-liquid assets, including private closely-held businesses, are often overlooked as a source of charitable giving. This seminar examines the technical considerations, the tax and legal aspects, as well as the opportunities that arise when business interests and other non-liquid assets are used to fund charitable gifts. Attendees will learn strategies for maximizing charitable giving as part of a larger business succession plan. Please RSVP to info@skinnerlawpdx.com. RSVP’s are limited to the first 10 people. Alzheimer’s & Other Dementia Challenges – Do you have a loved one with Alzheimer’s or dementia? Not sure if the right legal paperwork is in place? Need information on family support and community support? If so, you need to attend a class on legal and caregiving issues for loved ones with dementia. The event is free and includes snacks. Have questions about estate planning? Not sure what will happen if you pass away without a will? 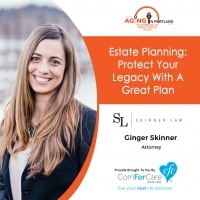 Need information on doing an estate plan? Not sure whether you are receiving adequate information from an executor after a loved one has passed? If so, you need to attend an Estate Planning 101 class. The event is free and includes snacks. ➧ October 7, 2017: Aging in Portland Radio Show – Guardianship/Conservatorship: Who’s Looking Out For Your Best Interests? ➧ April 13, 2017: 2017 OWLS Rainmaking Mentoring Circle Kick-off! ➧ March 11, 2016: What to learn from Mark Zuckerberg’s charitable pledge of Facebook stock – Portland Business Journal.